What Happens To Unclaimed Luggage? Home ›› Luggage Travel Tips ›› What happens to unclaimed luggage? 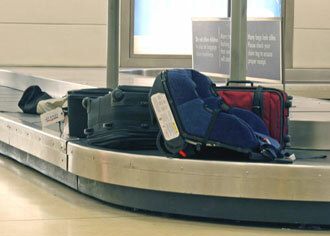 Most airlines define unclaimed luggage as bags that have been delayed, lost, stolen or damaged. In addition, there are items left on planes, which is quite common occurrence. The airlines make every effort to trace the owners of lost luggage and vast majority of lost bags are reunited with their owners within few days. There are though always some unclaimed bags that cannot be returned, e.g. due to lost luggage tags or because not labeled in the first place. So what happens to these bags? The airlines offer this lost luggage for sale after certain period (usually 3 months). Meaning you could find your bag in a lost luggage store or at a lost luggage auction. How Many Bags Are Unclaimed Every Year? According to the US Department of Transportation (DOT) airlines operating in the US mishandled 3.39 out of every 1,000 bags in 2011 (or 0.339%). Worldwide it is generally estimated that between 0.5 - 1% of all check-in bags fail to meet up with their owners at their destinations. However, 80-90% of those mishandled bags are returned to their owners within 24 hours and 95-98% of them within 5 days. Over half of the remaining bags are then reunited with their owners within the next 90 days, thanks to the comprehensive baggage tracing process conducted by all the main airlines. This means that very small portion of mishandled bags ends up as permanently lost or unclaimed luggage. However, due to the share number of check-in bags worldwide this is still a sizable number of bags every year. In 2011 it was estimated that worldwide 1 million bags were never re-united with their owners. The airline lost luggage process tends to be similar between airlines. Usually the luggage is kept at the airport for few days (usually five days but up to one week). Vast majority (95-98%) of unclaimed luggage is returned to their owners during this period, most actually within 24 hours (80-90%). Luggage that is not located during this initial period is moved to central warehouse where it stays for defined period (usually between 60 to 100 days). During this time, the airlines make all effort to find the luggage owner and the major airlines use the World Tracer System to help them do so. The World Tracer System is comprehensive airline information management system for mishandled property and provides continuous tracing for up to 100 days. It looks to match the tag numbers, baggage type, color and brand of unclaimed bags to those held on the database. Luggage still unclaimed after this period is disposed of. It depends on the airline which method they use for disposing of permanently lost luggage. It is up to the airline how they dispose of the luggage that cannot be reunited with their owner. Some held lost luggage sale / lost luggage auctions and donate the proceedings to charities. Others sell the bags unseen to unclaimed luggage stores. The airlines are not making money out of selling lost luggage, only a small fraction of the total cost of trying to trace the owner and the claim settlement (you are entitled to monetary compensation for your lost luggage by an airline) is recouped by selling the unclaimed bags. The most famous unclaimed luggage store is the Unclaimed Baggage Center in Scottsboro, Alabama, US. They buy lost luggage directly from airlines with the contents unseen. They unpack the bags and sell the content, as well as the empty bags. And there is no shortage of stock, over 7,000 new items come into the lost luggage store every day (despite them donating about 40% of the items they purchase to charities). This unclaimed luggage store has turned into popular tourist attraction, attracting over 800,000 customers every year. Note: You cannot contact them looking for your lost luggage. They have no passenger information or liability for the items bought from the airlines. Not everything goes to unclaimed luggage stores. Some airlines give unclaimed bags to charities and other put them up for a lost luggage auction, i.e. like most of the big UK airlines do. How Can You Avoid Losing Your Luggage In The First Place? It is not only losing your bag that you have to worry about, you also want to keep your bag safe from being tampered with or stolen. Find out more on how to Keep Your Luggage Safe. So, What To Do If You Lose Your Luggage? When you realize that your bag has not arrived with you at your destination, make your way to your airline counter, or their local representative at the airport, and report the loss immediately. Do not go home or to your hotel without reporting your bag missing. Provide your airline with as much information as possible; they usually have forms you have to fill in with different images of bags. It is actually advisable to own a photo of your bag, as it will help you to describe it satisfyingly. This is easy to do with your smart phone or pocket camera. Without the bag in front of us, most of us have problem remembering the details of how our unclaimed luggage looks like or even the color of it. Remember, most mishandled bags are relocated within few days but if your bag is permanently lost then you are entitled to monetary compensation from the airline and possibly from your travel insurance policy. If your airline loses your bag on your way out, you should ask them to pay for emergency supplies, such as toiletries, some clothing to get you through the next day until you are re-united with your bag. They may comply, but not necessarily. But if you don't ask, you don't get.